2 X 14 Stamped Steel Floor Register - Brown Discounts Apply ! This 2 x 14 brown vent is a classic style register with a contemporary look. Louvered floor register features all steel construction with welded seams. Your brown vent register has a working steel damper that can be adjusted by foot or hand. Louvered floor registers have a durable powder coat finish. These brown vents offer a neutral color that will work nicely with any style. These louvered floor registers are great quality and value. ***Hint: The industry standard is to order using the actual floor hole size and not the brown vent faceplate size. This louvered floor register will fit a 2.25 x 14 inch hole opening. You can purchase louvered floor registers in other sizes and in white if you would like. 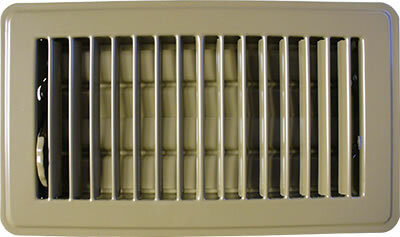 These brown vents are an affordable option to replace the registers throughout your home, purchase today!